At GCL UTV, we recognize the three main goals of a dealer………. Take care of those three goals and it’s likely everything else takes care of itself. The GCL UTV Dealer Program allows you to do all three. Let GCL UTV help close the deal. Our premium line of cab enclosures and polycarbonate windshields will enhance your customer’s appetite. We use the finest materials available when manufacturing our enclosures. Our solid color enclosures are made from Top Gun®, the finest professional grade marine fabric made of 100% polyester with stay-true long lasting colors with stabilized fit of less than 1% stretch or shrinkage. Our camo designs are made of a heavy 11 oz 1000 denier cordura nylon with polyurethane backing. All of our fabrics are water repellent, tear resistant, puncture resistant, mildew and UV resistant. Our vinyl windshields, door windows, and rear windows are made of durable Aqua-View Smoked vinyl allowing for an uninhibited view and total clarity. Our hard windshields are manufactured with ¼” polycarbonate. We’ve seen the 3/16” poly bow at high speeds and when towing. We also use the finest clamps in the industry, Quick Connect Clamps. The Quick Connect Clamps make installation a breeze. Finally, we line our hard windshields with heavy duty automotive rubber molding to help stabilize and reduce any rattle while off road. The GCL UTV Dealer Program pricing allows dealers to offer GCL UTV Enclosures at a competitive price while retaining a great margin. GCL UTV is proud of our product quality and customer service. All GCL UTV Enclosures are hand measured and handcrafted to ensure a precision fit. To service our customer's needs, many of our enclosures are available for immediate shipment from our in-stock inventory. 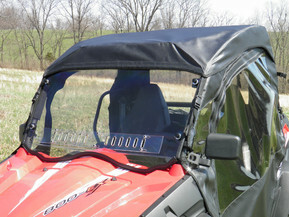 For enclosures that are made to order, GCL UTV offers the fastest turn time in the industry. GCL UTV offers a 100% customer satisfaction guarantee and fully warrants all products for 1 year against manufacturing or material defects under normal use. The GCL UTV Dealer Program gives each dealer 24/7 sales service. GCL UTV will provide each dealer with sales materials to support your sales efforts. Also, each dealer is allowed to purchase "showroom” enclosures below the dealer price. Dealers are limited to one "showroom” enclosure per calendar quarter. To get started selling GCL UTV Enclosures, click on the "If you are a Dealer and need to sign up” button below or give us a call at 858-285-7205. Click Here if you are a Dealer and need to sign up.